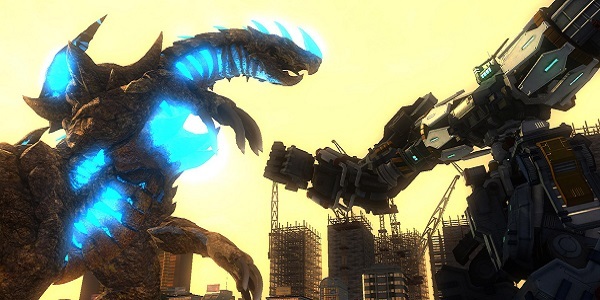 Earth Defense Force 4.1: The Shadow Of New Despair Review: Kill Em! Kill Em All! When I sit down to watch a movie, sometimes I want Citizen Kane and other times I want the pure, mindless fun of a Syfy original. The same goes for gaming, too. And when it comes to games, few series pull off the unadulterated fun of a straight-to-TV B-movie quite like Earth Defense Force. And now that we've got Earth Defense Force 4.1: The Shadow of New Despair for the PlayStation 4, we officially have the best offering in the series to date. Earth Defense Force is one of those game series that shouldn't even be around today. It started off as part of a bargain line of games in the PlayStation 2 era, boasting entertainment with rough-as-hell edges at a discounted price. Something about mindlessly shooting massive bugs with hundreds of weapons as building crumble around you, though, spoke to the heart of many gamers. The series took off in Japan and even found a cult following here in the States. 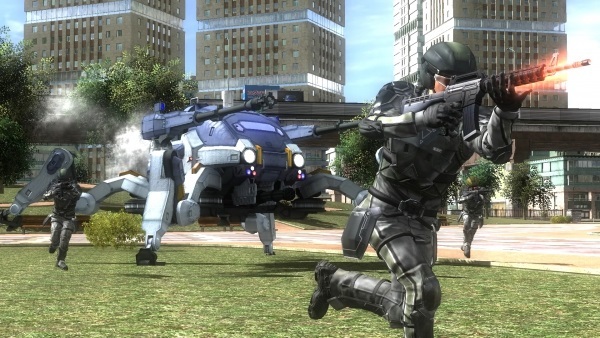 Earth Defense Force 4.1 is an enhanced version of the fourth game in the series, but it will appear extremely familiar to any longtime fan. That's due to the fact that this is a game that borrows extensively from past iterations, including locations, gear, enemies and even scenarios that series vets have already blasted their way through. In other words, if Earth Defense Force has never grabbed your attention in the past, it's unlikely it will pull off that feat on the PlayStation 4. If, however, you've been happily shouting “EDF! EDF! EDF!” over the years, you're going to be rewarded with the smoothest running, crispest, most enhanced version of that familiar formula to date. Shadow of New Despair takes place seven years after the initial bug/Ravager invasion. We puny humans thought we had overthrown the alien threat but, as the wonderfully cheesy subtitle foreshadows, Earth's greatest enemies have returned to wreak havoc once again. While massive ants, spiders, bees and more pour out of the Earth's crust, the Ravager threat appears from the skies, dropping off more giant bugs and mechanical monstrosities for you to pump a ridiculous amount of bullets into. Your objective here is almost always as straightforward as move to Point A, kill everything, Move to Point B, kill everything, repeat. There are a few scenarios that require you to mix it up a bit but, for the most part, you're just going to be running around, shooting lots of stuff, blowing up building and collecting new weapons. Your only real customization comes in the form of four playable classes. There's the high-flying Wing Diver, who packs a punch but offers little armor. The Air Raider is a new class that can call in vehicles and air raids, but he works best as a support unit in cooperative play. The Fencer is the meat shield of the group, offering the biggest punch in the form of dual-wielded weapons and even some melee options. Finally, there's the tried and true Ranger, who is a well-rounded shooter that plays about as straight as you can get. Each class also has their own massive collection of weapons to pick up, though many of them are only slightly upgraded versions of weapons you'll already have in your collection. Still, a healthy mix of weapons spread across those four classes gives you at least some opportunity to get creative with how you want to tackle a specific mission. The inclusion of multiple difficulty settings and even the ability to adjust your armor value to make the game even harder means there's plenty of challenge waiting for players who want to dig in deep. As you might have caught wind of when I mentioned cooperative play a moment ago, EDF 4.1 offers both online and offline modes, and that's exactly how you'll want to dive into the game once you understand how the various classes work. EDF is decent fun on its own, but that gets magnified greatly when you've got a friend on the couch (coop or admittedly lackluster competitive modes) or up to three friends online. There are even a handful of missions that can only be played online, making finding a crowd of like-minded bug killers even more inviting. And really, that's just about all there is to know about the core of EDF. The game takes place over the course of nearly 100 missions but, save a few boss encounters and even a new handful of scenarios that have you piloting a mech against a kaiju, your goal is almost exclusively to shoot until there's nothing left to shoot at. As mentioned earlier, though, this is the best the series has ever been. From the graphics to the sound, everything on the technical side has received an extra layer of polish, even if the game still doesn't exactly stack up to modern standards. There's a crisp frame rate even with dozens of enemies on screen, and I only ever saw some minor slowdown when the action was almost too huge to be believed. We're talking a massive walking tank, maybe a hundred enemies zipping about and an entire city block exploding and crumbling to the ground all at once. Other enhancements include vehicles that control a bit better and finally offer a targeting system that lets you know where you're shooting. Still, you'll probably want to stay on foot most of the time, as vehicles still have a long way to go before they feel comfortable/useful enough to bother with. Communication can be carried out with a wheel of dialogue options available through the touchpad, with even more specific messages available through a pop-up menu. To be honest, this is mostly for fun, as you'll never really need to coordinate an attack even against the toughest opponents. Everyone knows to just keep shooting the things until there are no more things to shoot. There is a nice option to ping a specific target/location, though, in case the other players aren't focusing their attention where they need to. My biggest gripes with EDF 4.1 relate to the standard controls. I wish a few more guns allowed for a mild zoom, and movement is still extremely slow. The Air Raider can zip around pretty quickly, but they crawl like molasses if you end up grounded. Even the Ranger's top speed on the ground leaves plenty to be desired. Finally, there's the continued lack of a checkpoint system bogging the proceedings down. Most encounters move at a quick clip and don't overstay their welcome. Restarting from the beginning of a mission in those instances is only a minor annoyance. For the longer missions or occasional tough fights, however, being shot back to the start of a 15-20-minute encounter can be infuriating. Despite all of that, EDF 4.1 can still be a heck of a lot of fun if you go in with the right mindset. It's a series that doesn't care whether or not games are art and it certainly isn't gunning for end-of-year awards. EDF focuses on the original, core concept of gaming: Being fun. I wish the developers would take a bit more player feedback into consideration between iterations but, otherwise, they're still delivering the goods.